1. REDUCE NOISE FROM EVERYDAY USE - Never again hear the annoying scraping sound of a chair being pushed against a hard surface 鈥?these screw-in furniture protecting felt pads help reduce noise from everyday use. 2. PROTECT YOUR HARD SURFACES - Everyday use and the movement of furniture would actually be scratching your hard floor surfaces. 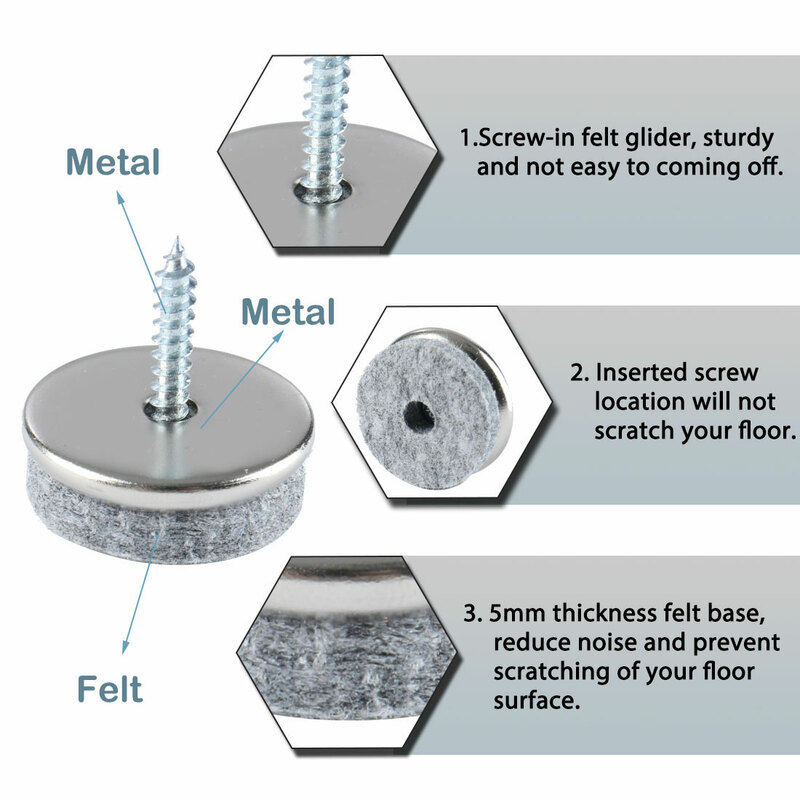 These soft touch screw in felt pads protect your beautiful hardwood, ceramic tile, linoleum floors and all other hard surfaces from scratches. 3. MULTIFUNCTION - Prevent scratches, protect your floors, reduces noise when moving furniture chairs tables, extend the service life of furniture and floor. 4. WIDELY USE - Suitable for tables, chairs, desks, stools, cabinets and other wooden feet, apply to the bottom of the infrequent heavy objects. It also can be used on the backs of furniture to avoid scratch to drywall or wallpaper. 5. MORE DURABLE - Stick-on pads are terrible. They were constantly falling off, collecting pet hair and dusty, or sticking to the floor everywhere to left sticky residue on your floor. But the screw-in felt pad is easy to use, no harm to your floor and easy to replace. 6. HIGH QUANTITY - Screw-in design grabs the furniture legs more firmly and tight. They are not easily fall off, strong and durable. 1. You need to draw an X line at the bottom of the foot of the furniture to find the center point of the bottom. Not only to prevent the furniture from cracking, but also to install in a suitable position to prevent the furniture from shaking during use and affect daily use. 2. Inspect the screw felt glider regularly, replace the bad one in time, and protect the floor better. 1. Idle items should be placed in a place that will not harm others. 2. Variability of 1-3mm is possible due to the measurement process.